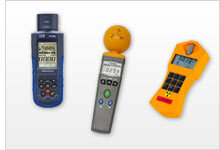 A radiation detector is a device for measuring nuclear, electromagnetic or light radiation. A nuclear radiation detector identifies nuclear radiation by measuring the emission of ionizing radiation of alpha particles, beta particles and gamma rays. Also referred to as a geiger counter, a nuclear radiation detector consists of two main elements: the processing electronics and the geiger tube. The geiger tube is filled with low-pressure inert gas like helium, argon or neon. If radioactive radiation occurs, the inert gas is ionized. An anode within the geiger tube registers the quantity of ionized particles numerically correlating with the strength of the radioactive radiation. The radioactivity measurement is then displayed on the LCD screen of the geiger counter or nuclear radiation detector. It is very important to measure nuclear radioactivity as well as to classify nuclear radioactivity values. For example, terrestrial gamma radiation is measured according to general values from 0.03 - 0.3 µSv/h (microsievert / hour). This "normal" oscillation range is conditioned by natural radioactive elements in the ground such as uranium and potassium. To calculate this factor, one must take into consideration cosmic radiation. For example, when considering cosmic radiation, the maximum radioactivity content at Schneefernerhaus, the highest-located German environmental research station, is approximately equal to 110 µSv/h. At PCE Instruments, you will find three types of geiger counter or nuclear raditation detection devices to help you measure radioactivity: 1) alpha radioactivity meters, 2) meters for detecting alpha, beta and gamma radioactivity and 3) radioactivity meters to be worn on the body. If you have any questions about the nuclear, electromagnetic or light radiation detectors on this website, please contact us at or +44 (0) 2380 987 035 for PCE Instruments UK, or at or +1 (561) 320-9162 for PCE Americas Inc.
PCE-EMF 823 is a portable handheld single-axis electromagnetic radiation detector or Gauss meter for measuring electromagnetic fields (EMFs). This user-friendly EMF meter is ideal for assessing risks associated with exposure to electromagnetic radiation emitted from electric power lines, home appliances and industrial devices. Radiation Detector PCE-UV34 measures radiation UV, with an external sensor. PCE-EM 29 is a portable handheld electromagnetic radiation detector with a spherical triaxial (3-axis) three-dimensional (3D) isotropic sensor used to measure electromagnetic fields (EMFs) as well as radio frequencies (RFs). This easy-to-use battery-powered RF meter features a large 4-digit LCD screen and an adjustable value limit with acoustic alarm functionality. PCE-SPM 1 is a photovoltaic (PV) light meter used to measure solar radiation, solar energy or solar power. The meter's easy-to-read 4-digit LCD screen clearly displays Ptot in W/m² or BTU/(ft² x h), while the device's auto data memory stores up to 43,000 data sets. PCE-G28 is a portable, handheld electromagnetic field radiation detector or gauss meter that detects electromagnetic fields (EMFs) and displays measurement results in milliGauss (mG) or microTesla (µT). This EMF radiation detector comes with an external 3-axis electromagnetic sensor (X, Y, Z direction). PCE-MFM 3000 is a handheld electromagnetic radiation detector or gauss meter that detects both static (DC) permanent magnet (rare earth) magnetic and dynamic (AC) electromagnetic fields (EMFs) and displays measurement results in gauss (G) or milli Tesla (mT). This portable magnetic field measuring device comes with an external sensor and features an RS-232 port for downloading data to a PC. The radiation detector PCE-RAM 10 measures α-, β-, γ- and X-rays and offers a high measurement accuracy and convenient design. Using the integrated Bluetooth interface in the radiation detector, the measured values can be sent in real time to a PC and analyzed with the included PC software. Radkeeper Personal is a compact, lightweight, portable radiation detector (also known as a geiger counter, radiation meter or radioactivity meter) that detects X-rays and gamma rays. When radiation greater than 10 µSv/h (1 mR/h) is detected, the radiation detector simultaneously beeps and flashes. As radiation increases, the interval between warnings becomes shorter. Corentium HOME is a handheld, portable radon radiation detector or radon monitor for measuring and recording radon gas concentrations over time. This long-term radon monitoring solution calculates average ratios per day or week. This digital device also determines the cumulative value for a whole year. Radiation detector with internal memory and software. Radiation Detector with acoustic signal, internal memory and software. The radiation detector PM1208M combines a geiger counter for gamma rays with the design and functionality of a modern wrist watch and was designed for the continuous monitoring of the environmental radiation level. The degree of radiation is shown on the display of the radiation detector as dose equivalent and dose equivalent rate. If the specified threshold levels are exceeded, the radiation detector gives out an acoustic signal.